Used Car Face Off: Why Be Mean To A Wedge? The Triumph TR7 represents an easy target for me. I can't get over how much it was called "the shape of things to come" when the shape of things to come was really Triumph going out of business. But it wasn't the only sports car that tried to impose a pointy future on us. Fiat had a similar idea with the X1/9, another car that's pretty much rusted into oblivion. In theory, these are very similar cars. In theory, they're cheap buys that also aren't obvious choices. But would you choose either of them? The 1980 TR7 convertible I've picked out looks rather nice – for a TR7. If you've never warmed up to the looks, this car won't change it. But as a droptop and in green, the Triumph looks handsome. And considering this is a fairly late example, it may even be screwed together correctly. Maybe. It's a similar story on the inside. More classic British sports car colors mask the fact the TR7 was saddled with a wheezy 2.0-liter four living in an emissions controlled world and never putting out more than 95 horses. Still, I love those tartan inserts in the door. Most TR7s haven't been babied like the more classic Triumph roadsters and they're never going to be appreciated like the others. The TR7 probably doesn't deserve all of the contempt leveled at it, but it's fun to make fun of the wedge. I must say this is the nicest one I've seen in a long time and I've really warmed up to it. The Fiat X1/9 is another car I haven't actually seen on the road in a very long time. They're still out there, though, because I do see ads for them fairly regularly. 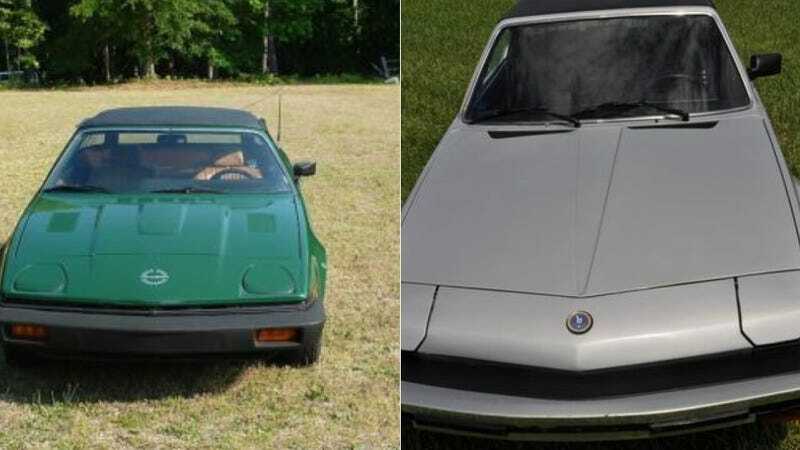 This 1984 X1/9 isn't technically a Fiat, though, it's a Bertone. Yes, the X1/9 was one of the Fiats that didn't leave the U.S. right when its parent began a three-decade hiatus from our shores. Think of it as another one of Malcolm Bricklin continuing to import this car as one of his gifts to the automotive world. Even alongside the TR7, there's something a little more off about the X1/9's appearance. Maybe it's the massive slab of black covering up the mid-mounted 1.5-liter four. It's not totally unattractive, though, at least in silver. Thankfully, Toyota took this recipe and added some more horsepower and reliability to make the more appealing MR2. Again, thanks Mr. Bricklin. The interior has zero charm whatsoever, so the TR7 wins that contest. Could the plastics in here be any more depressing? It is astonishing what a little plaid can do. If it were between at Fiat Spider and a TR7 convertible, I'd have the Fiat. But presented the contest here and I'd side with the Triumph. One as nice as that goes a long way into making that '70s sports car an appealing oddity. Something tells me the X1/9 will never be as a appealing.